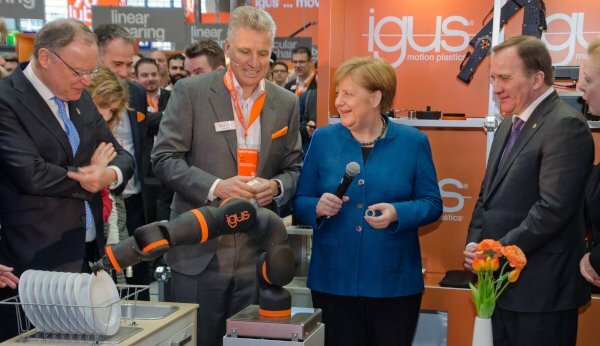 VIP visit at the igus stand: German Federal Chancellor Dr Angela Merkel and Swedish Prime Minister Stefan Löfven visited the stand of the motion plastics specialist igus at this year’s Hannover Messe. The main focus of interest: cost-effective “robotics made in Germany”. At Hannover Messe, the world’s largest industrial show for automation and Industry 4.0, the chancellor looked into the future. The service robot arm which was on display could soon be drying the dishes and laying the table. “When she returns to private life, we would like the chancellor to have the same service that she had during her time in office. This will give her more time for other things such as writing books on politics or science”, said CEO Frank Blase. “In one or two years, such a robot will be ready for mass production and will then be affordable.” igus is using Hannover Messe to start talking to customers from the world of household appliances. Service robotics is an important issue of the future for this branch of industry. In order to make robots affordable for every household, igus GmbH bases its gearboxes, articulated joints and connecting components on its 50 years of pioneering work in the area of motion plastics technologies. These are lubrication-free and maintenance-free, high-performance plastics developed independently by the company. The products that are created are cost-effective and, at the same time, extremely durable. Located in Lind, a borough in the district of Porz in Cologne, the family-run company has 4,150 employees with an annual turnover of 748 million euros and is one of the world’s leading manufacturers of energy chain systems and polymer plain bearings. Every year, igus makes inroads into new areas of industry. The company’s most recent innovations were 3D printing for wearing parts with a service life that can be calculated online, and lubrication-free ball bearings made of high-performance plastics. According to a study of RWTH Aachen University, an annual saving of more than 35 million metric tons of lubricating oil can be achieved if lubricants are dispensed with. At the same time, around 50 percent less energy is needed for the manufacture of polymers than for steel and 70 percent less than for aluminium. Motion plastics are increasingly becoming high-tech components. “Smart plastics” is what igus calls products that monitor themselves during use and tell the customer how long they will continue to last. Before a product is actually used, the customer can carry out a simulation online to find the solution with the best price/service life ratio. Enormous investments in digitisation are now being made to help the company to participate in the robot industry. In conjunction with 16 other industrial partners taking part in Hannover Messe, igus will be presenting RBTX.com, the world’s first robotics platform which brings suppliers and users of low-cost robotics together. Users can put together an automation solution online that matches their requirements and budget. Suppliers of robotics components are given the opportunity to market their products to a larger public in a new marketplace. igus is betting on the dynamism of the robot community for the joint development of new low-cost concepts. “In at least two years, the kitchen robot must be able to do Dr Merkel’s housework,” said Frank Blase.